A pretty cool visual movie that has lots of tie-ins to the original film and a fun premise about characters changing and becoming the way we know them to be. oz the great and powerful is a pretty well-made movie. the visuals and ideas are spectacular. it’s a movie that really has fun with creating a whole new world, the same way that james cameron did with avatar. but aside from the visuals, the storyline is pretty cool too, involving the discovery of the wicked witch, and the wizard realizing that he is more than who he thought he was. there are all kinds of cool plants and creatures on hand here, and credit that to director sam raimi, who has always been one of the most imaginitive directors around (ever since his evil dead days.) what also makes the movie a lot of fun are all of the tributes and nods to the original film. we get to see how many of the things that were in that first movie came to be. this prequel takes plenty of ideas from the first one, that were never explained, and gives us the explanation or back story. the movie does slow down and get predictable at times, and it follows a pretty straight forward path, but overall it turns out to be a fun experience. 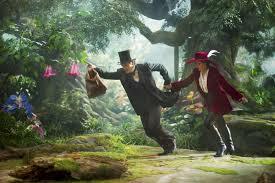 Oz The Great And Powerful is a prequel to the classic film, the wizard of oz. 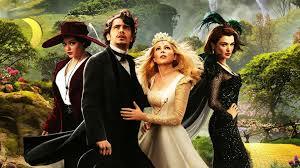 we’re at a time now where creativity and audiences have taken a turn into the genre of fairy tales with everything from Jack and the Bean Stalk to Hansel and Gretel to Snow White getting a movie. Most of these films are made by Walt Disney studios. So it’s no surprise that this new oz movie would be made. And while not quite a fairy tale, it certainly comes from the same basic ideas. a magical land, a wicked witch, and a young girl, or in this case, a wizard. The movie stars James Franco as Oz, and I like the way the movie addresses the fact that he has the same name as the land where he arrives, instead of making us just think it is a coincidence or disregarding it. Characters speak of how there is a prophecy that their land will be saved by a great man who bares the same name as their land. I also like how for most of the movie, oz is not sure if he really is that man. he is a swindler and an illusion artist, but not a guy who does great things for real. at the start of the movie, we see him in kansas in black and white. it’s pretty cool and a nice tribute to the way the original film began. oz is a circus magician, and he has an assistant, played by zach braff, who makes all of the sound effects in the background, while oz is performing. when a strong man gets furious about oz and starts chasing him around the circus, oz hops in a hot air baloon and takes off. 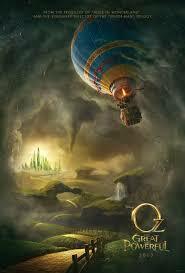 and when the hot air baloon heads right into the center of a tornado, oz passes out and wakes up floating into the magical land of oz. at this point the movie goes into color. the screen image which was a square, and only filled about half of the screen, now goes into wide screen mode so that the entire screen is covered. all of this is very cool. i’ll always remember the movie space cowboys, starting in black and white and then going into color after an introduction. the color is never more vibrant and alive then when it comes out of black and white. i noticed it in that movie, and you can really feel it here, in oz. the widescreen move adds a little more to the image, but the colors here are just fantastic. sam raimi is the guy behind this film, and that’s one of the main reasons why i wanted to see it. raimi is one of those ultra visionary directors like peter jackson, james cameron, or guillermo del toro. there aren’t many guys like this who specialize in fantasy and the unbelievable. most directors try to make realistic films that are grounded in the real world. but this small handful of creative minds is what has brought us some of the coolest fantasy movies of the past decade, other than comic book films. raimi got his career kick started with the evil dead films, which were a lot of fun. that was early raimi. then in the last decade or so, we spun out the spider man trilogy with tobey maguire. while note everything worked in those movies, raimi showed that he was still on top of his game, when given the right amount of freedom, by making drag me to hell. this is clearly a guy with ideas. once we get to the city and meet evanora, we start to get a sense of what’s going on here. oz is basically meeting one character at a time. next he will meet glinda, of course. and then the munchkins. only first he needs to pick up a few more creatures to join his group. just like dorothy, in the original films, and how she traveled with three other creatures, oz does too. first he meets a cute little flying monkey in a bellhops uniform (voiced by zach braff), and that monkey becomes his sidekick. then he meets a china doll with broken legs (representing the girl in the wheel chair who asked oz to make her walk, at the start of the film.) finally, he meets glinda, played by michelle williams (who also played a woman oz had a relationship in the early, black and white, portions of this movie.) just like the first film, where each of the characters dorothy came across in oz were representative of someone who she knew back home, this movie does the same thing. it’s a nice tribute, and a pretty cool move. glinda does become the fourth member of their group as the bunch of them run through the scary forest and jump into a cloud filled with bubbles. now we see what glinda’s bubble, from the original oz film was all about. they end up in munchkin land where we do get a musical number before getting to what the problem is that these people are facing. meanwhile, we see the two other sisters back in emerald city, (theodora and evanora), and watch as the wicked witch is created, green makeup and all. it’s pretty cool who the witch turns out to be, and not at all who one would expect. as the movie heads toward it’s showdowns in emerald city, you get the sense that a war is coming. this starts to feel like the lion, the witch, and the wardrobe movie, and taking a classic film about magical discoveries, and then turning it into action. the original wizard of oz film was never about that, but this is a different time. that classic movie did have an army of flying monkeys, but we never saw them do battle. here, there is a pretty cool monkey attack in the poppey fields. and then we get oz taking on his enemies. the wizard of oz is flawed only in it’s story, which sometimes gets a little too simple and dull. those times happen in the middle of the film, and then only hinder the movie slightly. in all other areas this movie succeeds. the visuals are amazing and the many tributes this movie has to the original, are fantastic. i love the way we really see how the wizard got his whole setup going at the end of the film, including why his chambers were the way they were when dorothy came to visit him in the original film. i also like the three witches and how there is a lot of changing between them to become the characters that we know. this is a very fun and creative movie, and i was happily impressed.